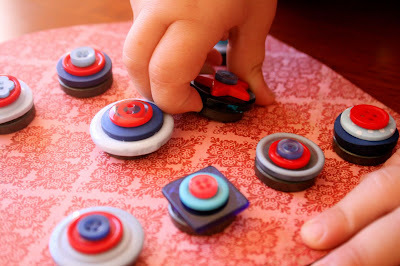 make it perfect: .button magnets. 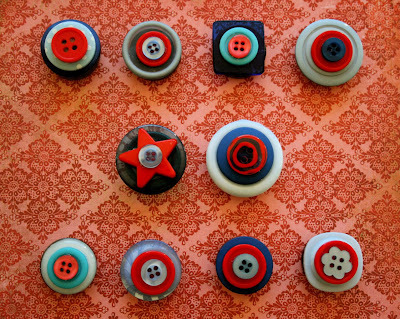 A few weeks ago Aimee gave me some really cool button magnets she had made. Ingenious! This set made their way to Jayne for her (young) birthday on Monday. Perfect for a blooming sewer who loves shades of blue! 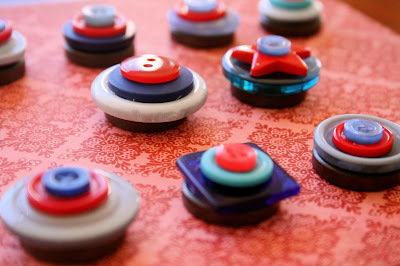 Guess what I will be making as soon as I get a spare moment! I recently found your blog and am really looking forward to reading it!! Speaking of your talents...Hallie is wearing her Make it Perfect outfit on our holiday so I can show it off across every place we visit on the mainland and hopefully people will ask me about it and I can prattle on about the amazing talent of one Toni Coward!! They look like liquorice allsorts... almost good enough to eat!